Simon is patron of Dyslexia North East, a charity supporting people of all ages with Dyslexia and associated conditions. In the statement below he explains his reasons for his passionate support for this charity. ‘Support for those with Dyslexia and associated conditions is vital to help address the negative connotations so many like myself have suffered. It was assumed by the founders of our education system, before dyslexia had been recognised, that one learning structure was suitable for all. Some people with reading difficulties, like myself, went on to have great success in life, many more were not so lucky. For generation after generation many dyslexics were failed by their schooling, dismissed as incapable or lazy. I myself wasn’t diagnosed with the condition until I was forty years old, the diagnosis changed my life, my bitterness fell away as I learned that, as I had thought as a child, I wasn’t lazy. I’d done so well at primary school and achieved seven A grades in my first term in secondary school. Not only was I not lazy, but I had tried so hard, doubling my efforts again and again, but to no avail, the idea that I didn’t try hard enough had been drummed into me by this time and I left school with only two O levels and a very negative view of myself. Despite my success, much of this negativity stayed with me for decades. When I look back I know that what could have helped me enormously was support. Being shown that I wasn’t alone, being shown that with the right tools and teaching I could achieve equally would have developed confidence in me instead of draining it away. As I write this I think of those who didn’t land on their feet as I did, I think of those who have felt rejected due to their learning difficulties and haven’t had the help get them on an even keel with their peers. 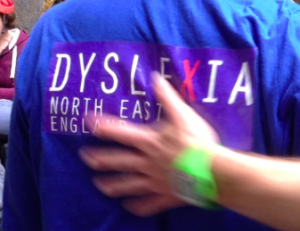 This kind of help, support and friendly expert advice is exactly what Dyslexia North East offers. Help with assessing, teaching, IT, finding learning tools to suit each person, connections to trusted specialists in associated fields and much more in terms of that all important word, support.